If you’re developing with minikube you need to use containers. 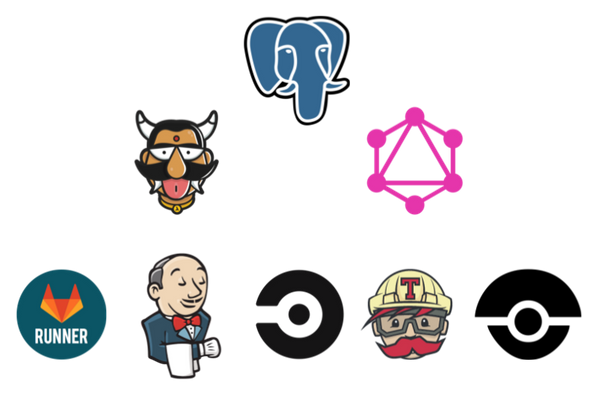 Containers need images, and during development you may want to frequently modify images. 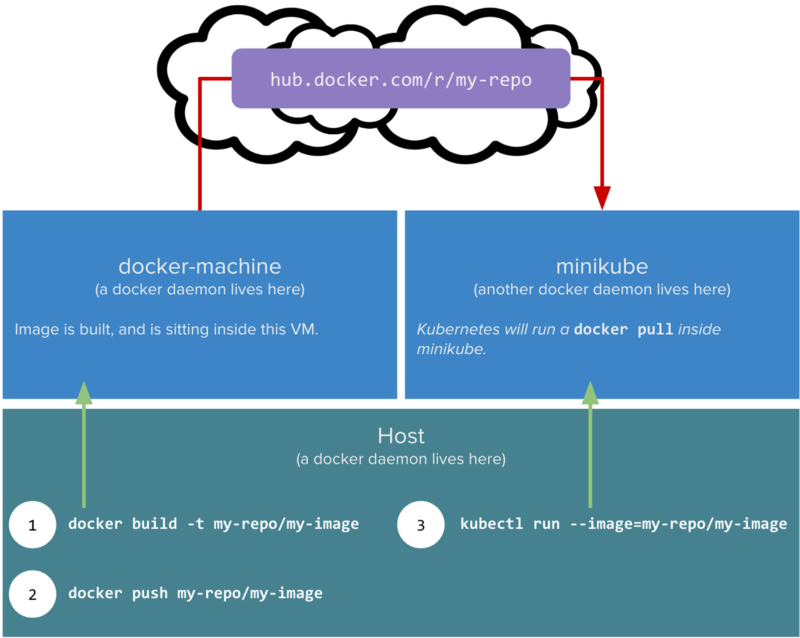 To complete your development workflow you need to get the images you build into minikube so that kubernetes can run containers/pods built off the image. For the rest of this post, we’ll use the more complicated case of having docker-machine to get our system running. I mean we entered the rabbit hole when we decided to roll with docker anyway, so why start making things easy now. 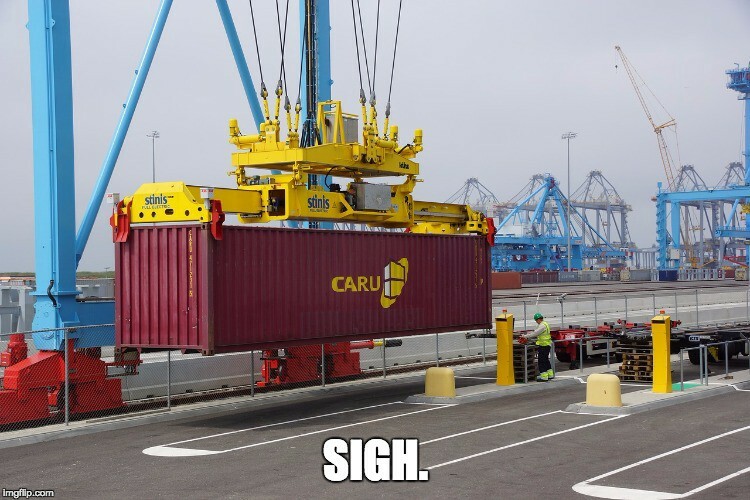 Push to docker hub, pull from docker hub. Kittens will die. 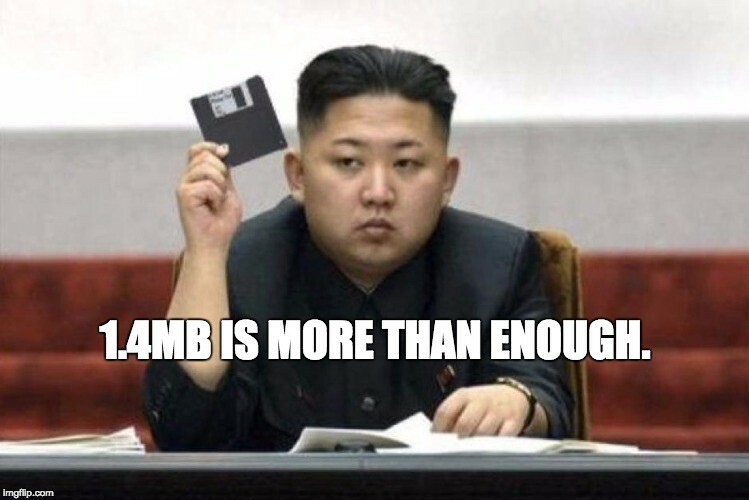 Also, uploading and downloading hundreds of floppy disks worth of data through ze internetz to just get software from one part of your computer to another doesn’t sound right. There was a time you know. There was a time when all this was enough. This will totally not work the first time. Or the second. Or the third in fact. Both docker push and kubectl run will fail because the registry is insecure. 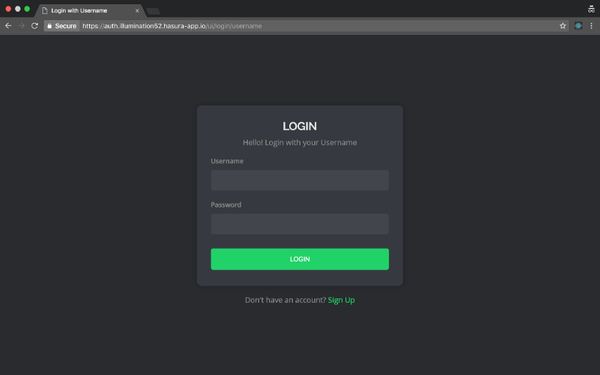 Use SSL certs and restart the docker daemon to get this to work, or set this as an insecure registry and restart the docker daemon to get this to work. docker doesn’t complain about pushing to or pulling fromlocalhost:5000 even if that’s an insecure registry. Ooooh. 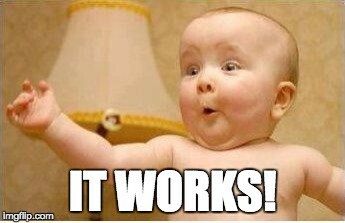 So: docker push should push to a registry named localhost:5000 and inside minikube, docker pull should pull from a registry named localhost:5000. Let the port-mapping shenanigans begin! Not sphagetti…just one long noodle really. 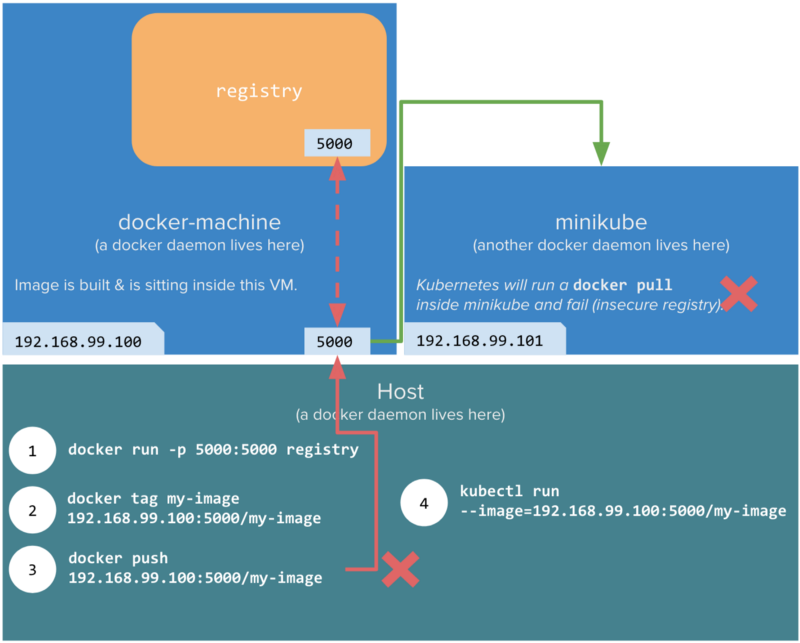 The idea here is for the docker daemon on minikube to be able to pull from a registry called localhost:5000. This is achieved by actually running a registry on minikube and then setting up a proxy so that the minikube VM port 5000 maps to the registry’s 5000. Now, we need to make sure that the docker daemon on docker-machine thinks that localhost:5000 is legit. 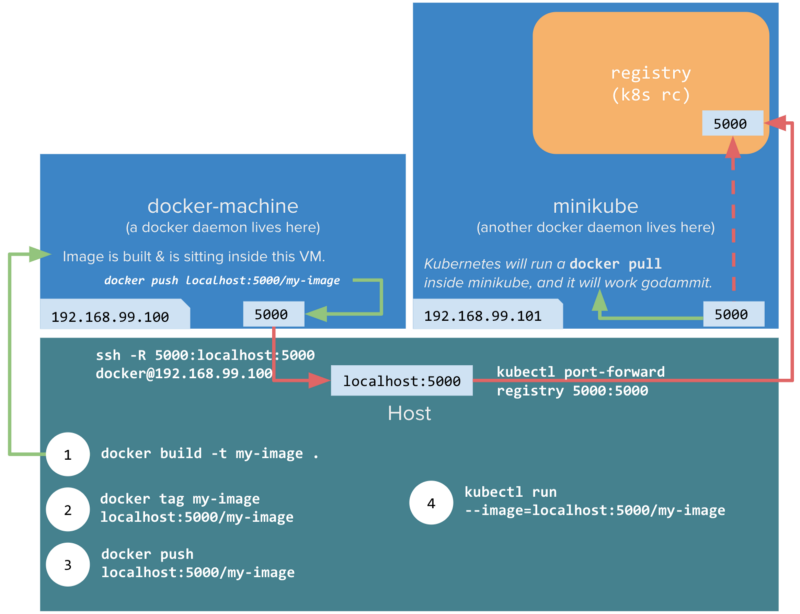 So, we map 5000 of the docker-machine ⇢ 5000 of the host (via a reverse SSH tunnel) and 5000 of the host ⇢ 5000 of the registry running on minikube (via kubectl port-forward). Ofcourse, if you’re one of the enlightened, you’re already running a linux host and of your 99 problems this ain’t one. Create a registry (a replication-controller and a service) and create a proxy to make sure the minikube VM’s 5000 is proxied to the registry service’s 5000. At this point, minikube ssh && curl localhost:5000 should work and give you a response from the docker registry. 3. Non-linux peoples: Map docker-machine’s 5000 to the host’s 5000. After this, running docker-machine ssh && curl localhost:5000 should return a valid response from the docker registry running on minikube. …and it’s truly amazing that it somehow does. It’s not elegant, but it works without fiddling around and restarting docker client, docker daemon, minikube flags, minikube’s config.json. All of which can change any time today, tomorrow or have probably already changed yesterday and you’re on an older version. Hah. Also, just FYI, we’ve spent a spectacular amount of effort in moving code a nanometer distance or something. 2017 y’all. Containers livin’ up to their namesakes.